My current sculptural work is a continuation of gathering and compiling discards. After moving to Northern California in the summer of 2012, I began using masses of eucalyptus seeds, acorns, and other seed forms. Stacking and organizing natural forms sloughed off during nature’s seasonal changes, I make molds of these forms, and cast them in wax. Multiple casts are combined in gestural postures, referencing life force at work. 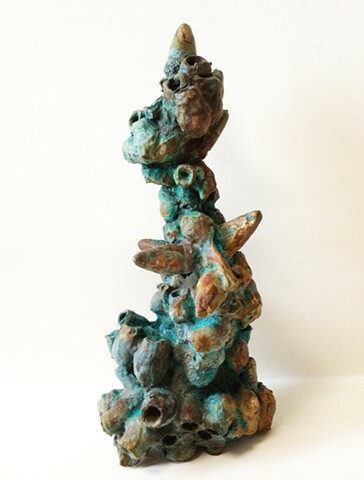 Finally the lost wax technique is used, resulting in the final bronze sculpture. Patina is achieved with natural acids applied over a short period of time and cured in the heat of the sun.